Football fans must see this video of a high school football game in Texas from 1994. Plano is down by a score of 41-17 with about three minutes to go in the game, and...well, we wouldn't be watching the video twelve years later if they hadn't come all the way back. But, there's a surprise ending that I won't spoil for you. The announcers for the game are alone worth the time you'll spend watching (about four minutes). "I done wet my britches"
Much of the problem from spam stems from ineffective enforcement action by ISPs. A small number of large ISPs go even further by knowingly selling services to professional spammers, or doing nothing to prevent spammers operating from their networks through either corporate greed or mismanagement. Although all networks claim to be anti-spam, some can't resist the lure of selling services at a premium to spam operations. Others simply decide that purging botnet-infected machines from their network is too costly. Spamhaus names and shames the networks it reports as having the world's worst spam problems. Worst of the lot is verizonbusiness with serverflo.com and sbc.com picking up the second and three places, respectively, in Spamhaus' list of shame. The Australian investigation into that country's involvement with the U.N. Oil-For-Food scandal is a model of transparency and accountability, at least when compared to the U.N.'s own inquiry. The Australian Wheat Board is alleged to have paid $220 million in kickbacks to the Saddam regime for the privilege of being a supplier of food under the program. The Cole Report included in its findings the recommendation that 12 people be criminally prosecuted for their roles in the scam. That would be about a dozen more people than were prosecuted as a result of Paul Volcker's official U.N. investigation into the entirety of the multi-billion dollar Oil-For-Food heist. Claudia Rosett reports. Instapundit linked to this article at Slate about the prototype of a new electric car, the Tesla Roadster, and I figured that not quite everyone in the world saw it there. One thing the global warming alarmists never seem to take into account at all is the ingenuity of mankind to come up with innovations like this one which have the potential to revolutionize ground travel and drastically reduce CO2 emissions, perhaps even in the lifetimes of those of us already a half-century old. The downside of this vehicle is that the sticker is still $100,000, but that's not as high as I would have guessed it might be, since they're only making them a couple hundred at a time. Oh yeah, it's fast too. Details continue to emerge from Kremlin archives on how Ted Kennedy attempted to undermine U.S. foreign policy through secret contacts with our Cold War enemies, the Soviet Union. It wasn't just the foreign policy of the ("Evil Empire") Republican administration under Ronald Reagan that Kennedy deemed too harsh. He thought Jimmy Carter's response to the Soviet invasion of Afghanistan was too tough, (no, seriously) and had coordinated his criticism of Carter with the Soviets in advance. It looks like Yuri Andropov didn't take Kennedy seriously, but apparently Gorbachev found him to be a useful idiot. Much more in Vladimir Bukovsky and Pavel Stroilov's report at NRO. I want to make it abundantly clear: if thereâ€™s anyone who believes that these youngsters want to fight, as the Pentagon and some generals have said, you can just forget about it. No young, bright individual wants to fight just because of a bonus and just because of educational benefits. And most all of them come from communities of very, very high unemployment. If a young fella has an option of having a decent career or joining the army to fight in Iraq, you can bet your life that he would not be in Iraq. Rangel gets smacked down pretty thoroughly by Stop the ACLU (at the link) but I'll just add that Rangel continues to demonstrate that he has no idea who is in our military. Today's soldiers are better educated than their civilian counterparts, and are not disproportionately drawn from the ranks of the poor in this country. I think one reason certain Democrats want a draft is because they would then have a steady supply of Conscientious Objectors to exploit and promote. I guess Mr. Rangel is wondering....who would choose a government job if he could have a decent career? Alan Dershowitz pans the new Jimmy Carter book at the Huffington Post. Elie Wiesel calls for Iran to be expelled from the United Nations. Mark Steyn looks at four women in the news to figure out where we're headed. The Independent asks "Who Killed Litvinenko?" Kristol and Kagan say that "realism" looks an awful lot like surrender. And on a lighter note, even The Onion has a take on Ohio State-Michigan. I thought the outrage was misdirected and misplaced. The attention and money Simpson (and Fox) would have garnered from the deal are not half as outrageous as the fact that every day he walks free. The real outrage is the trial that declared him not guilty: the judge, a fool and incompetent whose love of publicity turned the trial into a circus; the defense lawyers, not one of whom could have doubted the man's guilt yet who cynically played on the jury's ignorance and latent racism to win a disgraceful verdict; the prosecutors, total incompetents who bungled a gimmie, then shamelessly cashed in afterwards; the media that turned the brutal deaths of two innocents into TV's first reality-show soap opera. ...has there ever been someone who responds to the murder of an ex-wife â€” a death he publicly mourned and pretended to be so aggrieved by that he would spend the rest of his days looking for "the real killers" â€” to engage in the exercise of telling how he would have cut her throat? No survivor of a murdered spouse who is innocent could do anything so grotesque. Can you imagine Daniel Pearl's widow writing a book about how she would have conducted the beheading of her husband? Or Jehan Sadat going on television to describe how she would have engineered her husband's assassination? Such things are impossible. The mere act of engaging in so unimaginably repulsive an exercise is the ultimate proof of Simpson's guilt. Page 2's Bomani Jones has five reasons to rematch Ohio State and Michigan, and five reasons not to. For me, the biggest reason not to is that the BCS Championship is supposed to decide conclusively who is No. 1, But if Michigan wins a rematch, what has really been decided? That we need to play a rubber match? I'm not really worried about that happening, because I think USC will beat the Irish and see the Buckeyes in Glendale, but these Bucks would handle Michigan again if they got there. Troy Smith will be in Glendale no matter what. Talk about punctuating a Heisman season. Saturday's game showed the story behind Smith's numbers â€“ it's hard to think of the last time a college quarterback has looked as in control of games as Smith does. His posture is perfect, his timing precise, his patience virtuous. While Vince Young's legend was built on the uncommon ability to react to what was thrown at him, Smith seems to know what's going to happen before it does and is simply buying enough time to do what he wants to do. It's breathtaking; anyone who misses his last game must not have a clue. And anyone who thinks Michigan, USC or any other team not playing on Sundays could beat Smith and the Buckeyes is foolish. No matter the opponent, the next Heisman winner and the next national champion are Must-See TV. I'm liking this Bomani Jones guy. Syria's Lebanese allies are trying to undermine the Hariri investigation from within, and are expected to escalate their efforts very soon, maybe even this week. It makes no sense for the U.S. to hand them more ammunition by prematurely transacting with Mr. Assad before the U.N. completes its task and assigns responsibility for the assassination. The occasion of the return to political power of Daniel Ortega in Nicaragua is a good time for a history lesson on the last time he and his movement held power in that country. Jamie Glazov has that today at FPM. Upon capturing power in Nicaragua in July, 1979, the Sandinistas immediately Stalinized the country and aligned themselves with Castro and the Soviet Empire, making their country a base for the export of Marxist revolution throughout Central America. ...The Sandinistas quickly distinguished themselves as one of the worst human rights abusers in Latin America, carrying out approximately 8,000 political executions within three years of the revolution. The number of "anti-revolutionary" Nicaraguans who disappeared while in Sandinista hands numbered in the thousands. By 1983, the number of political prisoners inside the new Marxist regimeâ€™s jails was estimated at 20,000. This was the highest number of political prisoners in any nation in the hemisphere -- except, of course, in Castroâ€™s Cuba. â€¢ Gas prices to drop to $1.25, because Republicans will no longer be able to feather the nest of Big Oil with obscene profits. â€¢ Cars to run on hydrogen, corn syrup and refried beans, because Republicans will no longer be able to control the laws of physics. â€¢ The wage gap to become non-existent, because differences in intelligence, drive, determination, personal responsibility and common sense will be outlawed. â€¢ Unemployment to drop to zero when the minimum wage increases to $22.35 per hour, because the demand for labor increases when the cost of labor increases, and not the reverse, as ignorant, mean-spirited Republicans had stupidly claimed. â€¢ Test scores of below-average students to skyrocket to above-average levels, because Democrats will outlaw the Republican-invented Bell curve. â€¢ The Dow to hit 18,000 in 2007, because it's an economic fact that the best way of growing an economy is to penalize risk-takers, innovators and the industrious. â€¢ The price of medicine and health care to plummet, because it's another economic fact that when you give people free stuff, demand goes down. Don't miss Michael Fumento's cover story from the new Weekly Standard, from on the ground in Al Anbar Province, Iraq. Fumento has completed three different embeds in Ramadi and Falluja, and without sugarcoating anything, he's cautiously optimistic. Pack a lunch. And don't tell Dennis Kucinich. ...Ramadi is both a litmus test for the counterinsurgency effort in Iraq and a laboratory. If we can defeat the insurgent and terrorist forces here, there is no place we cannot defeat them. And from what I found, we are defeating them. It's painfully slow, and our men there are still dying in inordinate numbers from a broad variety of attacks. But a multitude of factors, including tribal cooperation, the continual introduction of more Iraqi army and police, the beginning of public works projects, the building of more Forward Operating Bases (FOBs), the installation of more small operational posts (OPs), and plunking down company-sized Combat Operation Posts (COPs) smack in the middle of hostile territory are destroying both the size and the mobility of the enemy. This time the rats are dying in place. Of the many things I can remember about the trial--one of them being a chat I had with a DNA specialist who told me the statistical odds against the blood being proof of guilt, which really weren't "odds" at all--one detail that sticks in my mind was the incidental disclosure that Simpson can barely read or write. This is, in other words, not just a decision to publish "his" book. It is a decision, which must have been taken some time ago, to get such a book written and to get him to cooperate with it. The title is, of course, illiterate to start with ("If I Did It, Here's How It Happened" rather than "If I Had Done It, Here's How I Would Have") as well as an admission (because, however modified or qualified, the "Here's How It Happened" still stands on its own) but both of those offenses are quite possible in today's publishing. It would still be mildly interesting to know who cooked up the idea and who did the inducement and the ghosting. The only thing that definitely didn't happen, rather like his ongoing search for the real killer, was Simpson bringing in a manuscript and submitting it for publication. "Everything else pales before this"
...When asked if Bush could afford embarking on another "military adventure" after Iraq, Netanyahu said acting on the Iranian nuclear program would not be adventurous but necessary. "... Israel would certainly be the first stop on Iran's tour of destruction, but at the planned production rate of 25 nuclear bombs a year ... [the arsenal] will be directed against 'the big Satan,' the U.S., and the 'moderate Satan,' Europe," Netanyahu said. "Iran is developing ballistic missiles that would reach America, and now they prepare missiles with an adequate range to cover the whole of Europe." That sucking sound you hear is the United Nations yawning. At least with regard to the rearming of Hezbollah in Lebanon in violation of SCR 1701, and the militarization of the Gaza Strip. The U.N. has been busy condemning Israel for causing the accidental deaths of several civilians in Gaza when a missile missed its intended target, the source of a Hamas rocket attack. "This deepens suspicions about the United Nations that will lead many to conclude that the organization is incapable of playing a helpful role in the region," Bolton continued. "In a larger sense, the United Nations must confront a more significant question, that of its relevance and utility in confronting the challenges of the 21st century. We believe that the United Nations is ill served when its members seek to transform the organization into a forum that is a little more than a self-serving and a polemical attack against Israel or the United States," he said. "The Human Rights Council has quickly fallen into the same trap and de-legitimized itself by focusing attention exclusively on Israel. Meanwhile, it has failed to address real human rights abuses in Burma, Darfur, the DPRK, and other countries," Bolton charged. "The problem of anti-Israel bias is not unique to the Human Rights Council. It is endemic to the culture of the United Nations. It is a decades-old, systematic problem that transcends the whole panoply of the UN organizations and agencies," he continued. And third, I saw the video below at Ace's place today. It's extremely well done and well worth passing along. An Israeli Jew writes "An Open Letter to the World". Watch. UPDATE 11/21: In a stunning development, the New York Times editorial board backs up the criticisms of the new U.N. Human Rights Council by John Bolton. Full text after the break. The old, unreformed United Nations Human Rights Commission was selective and one-sided, but occasionally managed to do some good work. That may be more than can be said for its successor body, the Human Rights Council, born earlier this year of a weak-kneed compromise from which the United States stood honorably apart. If this is the best the U.N. can do at reforming itself, it isnâ€™t worth the effort. The council is new, but its deliberations have already fallen into a shameful pattern. When it comes to the worldâ€™s worst and most consistent human rights violators, like China, Iran, North Korea, Myanmar and Sudan, there has been a tendency to muffle words and conclusions and shift the focus from individual and political rights to broader economic and social questions. As the council prepares to resume deliberations next week, an ad hoc coalition of human rights violators is pushing for an end to the practice of singling out individual countries for special criticism and follow-up investigations. Those critical reports and follow-ups were the most useful thing the old unreformed commission used to do. The problem was that many other deserving targets were shielded by their diplomatic allies. Moving away from the practice altogether would be a decided step backward. To inspire respect and support, the United Nations must be more than a self-protective club of sovereign states. The test of that is whether it is willing to defend the basic human standards embodied in a succession of United Nations declarations and conventions. The new Human Rights Council now seems headed for a failing midterm grade. The Bucks ran up 520 yards on the vaunted Michigan defense today, and Troy Smith carved them up in the first half for 28 points. Then he did his annual clutch Wolverine-killing by leading the Bucks on an 85 yard touchdown drive in the 4th quarter to put the game out of reach. Smith had the Heisman Trophy wrapped up by halftime today. After 3 TD's in the first half, it was over. I feel so great for that kid. He's a Buckeye hero forever, no matter what happens Jan. 8. I agreed with commentator Bob Davie (for once) on his point that we just saw the National Championship game, and to take seven weeks off and then come out for another game, isn't the optimal way to decide the overall best team. This year. I think a Michigan rematch is unlikely, or at least it will be when analysts look back on this game, and see that OSU giftwrapped 17 points on turnovers and on the bogus PI on O'Neal on 4th down. Pollsters will realize that Michigan was fortunate to be within three, and that now another team deserves a chance to play the Buckeyes. They had their shot. The argument will be made that a team failing to win their conference shouldn't have the opportunity to go to the BCS Championship Game. I think UM is probably the second best team in the country, and that's why I want no part of a rematch with them. My heart couldn't take it anyway. Rutgers is getting handled tonight by a Cincinnati team that the Buckeyes beat 37-7, so that little fantasy is likely to be over. USC should be the Bucks' opponent if they win out. Several very questionable calls went against OSU today. Like the bizarre 4th and 15 cant-touch-the-center-on-the-punt foul. A seldom called penalty on a possession-changing play, which looked dubious at best on reply, as the center stood up, took a step back and got a little shove from our lineman. Unbelievable. Late hits on Smith were being ignored on more than one occasion before they finally called the flagrant one near the end. The bogus PI on O'Neal was ridiculous. You don't allow a team to convert a 4th and 16 on contact like that. I kept calling it the Bo Factor. The two bad snaps by Datish were clearly Bo's handiwork, no? Officiating aside though, it was still one of the best college football games I have ever seen. Congratulations, Troy Smith! Thank you, Troy Smith! 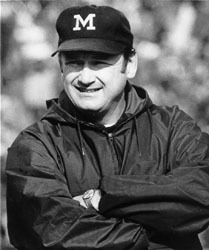 Bo Schembechler, Dead at 77. This is a very sad day in Ohio, Bo Schembechler's home. For Buckeye fans, losing Bo is like losing a part of Woody all over again. Bo was Woody's player, assistant, protegé and friend. Their rivalry was everything, and yet it was somehow secondary to that relationship. It is a loss felt intensely in my local area. I live and work about a ten minute drive from Bo's home town of Barberton. It has always necessarily been a love-hate relationship, with Bo being at Michigan. But at bottom, he was a local boy, made good. To speculate on what effect Bo's sudden passing might have on the 18-22 year-olds playing a college football game tomorrow would be silly, so I'll not try. The Game fairly drips with emotion in an ordinary year. This year's game was to be extraordinary even before this sad event. So it's difficult to imagine the emotional level being ratcheted up any higher. As for me, there will be an extra large knot in my gut all day. BO SCHEMBECHLER: OSU'S MOST VALIANT FOE: The band is crushed to learn of the death of Bo Schembechler. We named this band after Coach Schembechler to honor him as the face of Wolverine football. We have never wished ill will upon him in any way and have always wished him the best. When we learned that Bo had seen our web site and was amused by it we were delighted. We were simply delighted. He said to those with him as he read it, "See, I still matter in Columbus!" That may have been the greatest understatement in football history. We believe that he took the band's name as the compliment that it was meant as and that he was flattered by it. We wish to extend our deepest and most heartfelt sympathies to his family. We are truly sorry for their loss. My favorite remembrance of Bo was hearing him tell the story of the recruitment of Chris Ward, an All-American high school offensive tackle from New York back in the early 70's. Everybody wanted this kid, and the recruiting competition was fierce. Bo was convinced he had the edge, and was hoping to close the deal for the Wolverines by making a special holiday visit on Thanksgiving Day at the Ward home. He arrived around dinner time, as I recall the story, and as he entered the dining room, his heart sank. Damn... there was Woody, carving the turkey. It was, in a way, his lament at being forever in Woody's shadow, but he told the story in a self-deprecating way, and with a certain amount of awe and fondness for Hayes. Chris Ward became an All-American tackle for the Buckeyes and a first round draft pick of the Jets in 1978. But in the "Ten Year War", the games from 1969-1978, when Bo and Woody faced off against each other, Bo Schembechler did not come out second best. His record in those games against his mentor was 5-4-1. There's a good Friedman tribute page here with an entertaining video of a Friedman lecture, and IP has lots more links. Larry Kudlow has a good post too. See Michelle Malkin too, natch. UPDATE 11/18: Thomas Sowell, who was one of Friedman's students, on his former professor. The Wall Street Journal also has a collection of excerpts from Friedman's contributions to that publication. Claudia Rosett reviews a new paean to Kofi Annan for the New York Sun. Ladies and Gentlemen....the latest by The Dead Schembechlers..."Bomb Ann Arbor Now"
I knew there was something I didn't like about this guy. And just so I'm on the record with my prediction: OSU over Michigan 27-13. 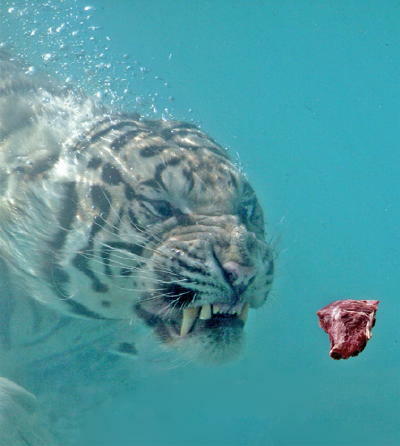 This was the Second Place winner in the "Animals and Nature" category. I thought it beat the heck out of the First Place shot, but what do I know? Decide for yourself at the website for the Digital Camera Magazine Photographer of the Year 2006. How unpopular? Well, they were banned by a margin of 58-42 percent of the popular vote; in a blue state; in a Democratic year; with opponents vastly outspending the supporters; and the former calling the latter racists and sexists. The voters approved the amendment over the well-publicized objections of the corporate establishment, and the political establishment (Democratic and Republican alike), and the media establishment, and the civil rights establishment, and the labor unions, and even the clergy. And this success follows that of identical bans â€” also by decisive margins â€” in two other blue states (California and Washington) in two other Democratic years (1996 and 1998). Before the universityâ€™s administrators expend vast funds trying to overturn Proposal 2, they should at least explain to students, the voters, and taxpayers why the school seeks to perpetuate a program that does manifest and considerable harm to its purported beneficiaries. Why is it, for example, that the University of Michigan and other selective schools continue to promote racially discriminatory admissions policies that lead to greater academic failure among black and Hispanic students than what results from racially neutral policies? Why do they extol policies that suppress black and Hispanic graduation rates? Is the University of Michiganâ€™s mission to educate and graduate students or is it to placate racial bean counters? The continued defense of racial discrimination in admissions is no longer contrary just to the principle of equal treatment, but to empirical evidence as well. Perhaps twenty years ago academic elites could hide behind the veil of uninformed good intentions to justify racial preferences; today, hard evidence continues to mount demonstrating that racial preferences have a devastating impact on preferred minorities. Why didnâ€™t President Coleman mention in her address the myriad studies showing that the â€œbenefits of diversityâ€ are, at best, negligible and most likely illusory? Donâ€™t academic elites think that black and Hispanic students should know about (to cite but one example) the studies by UCLA law professor Richard Sander showing that because of the mismatch effect caused by affirmative action (i.e., under-qualified minorities being admitted to schools at which they have difficulty competing) half of black law students cluster at the bottom 10 percent of their respective law-school classes? Would college administrators continue to mouth platitudes about affirmative action if their students knew that preferential admissions cause black law students to flunk out at two-and-a-half times the rate of whites? Or that black law students are six times less likely to pass the bar? Or that half of black law students never become lawyers? TAE: You say that as long as we have affirmative action, blacks will never be able to take full credit for their own advancement. STEELE: Absolutely. It smears every single black person. Look at me, for example. My enemies say my career would have gone nowhere without affirmative action. I donâ€™t think thatâ€™s true, but because there is affirmative action, they can say that. There are no blacks who are free from that stigma, and thatâ€™s a terrible thing to do to people who are trying to succeed on their own. I think affirmative action is the worst cruelty blacks have endured since slavery. Blacks do well in sports, music, entertainment, and literatureâ€”because thereâ€™s absolutely no white intervention, paternalism, affirmative action, or anything else. Weâ€™re asked to compete without any assistance, and sure enough, we compete. We succeed. In these areas, whites never intervene, so we ask the best and we get the best. But in colleges and other places, there are a billion excuses. Whites intervene and convince themselves not to ask much of us. Itâ€™s the same old vicious cycle. TAE: Should affirmative action be abolished? STEELE: Affirmative action and all of its sundry manifestations should be completely eliminated. It stigmatizes all blacks, and itâ€™s not voluntary. One of the real cruelties of affirmative action is that whether we want it or not, it is imposed on us, simply because of the color of our skin. You donâ€™t get to opt out. UPDATE 11/15: Jonah shows up today with a related column on preferences. A little comic relief. Excuse the descent into the realm of "Cops"-like video, but this is funny. The moral of the story: Don't get drunk before you try to pull off the liquor store robbery. Via LGF: A photograph used by Time magazine purporting to show damage caused by an Israeli air strike in Lebanon turns out to be something else entirely. The photographer has come forward at the Lightstalkers blog to tell how Time ignored his description of the photo's context, and added a fictional caption of their own composition. Who is surprised? If you missed the two companion essays in the November issue of Commentary magazine, it might be a good idea to go read and/or save them before they go behind the subscription wall later this month. Amir Taheri discusses the importance of maintaining the U.S. policy of "regime change" towards the government of Iran, not necessarily in terms of advocating a military invasion of the country, but by taking advantage of what he feels are the internal conditions there which make the mullahs' regime vulnerable. Then, Arthur Herman lays out a possible military scenario which he feels would have a good chance for success, if it comes to that. It concentrates on aerial and offshore operations which would cripple the Iranian regime economically, without confronting the Iranian army on the ground or risking the casualties of an American invasion force. Pack a lunch, they're a bit long, but I'm betting you'll be glad you took the time. Certainty is the enemy of decency and democracy. And Andrew Sullivan is sure of it. Jonah Goldberg reviews the Sullivan book. "Rumsfeld and the Realists" - Must reading from Michael Rubin at opinionjournal.com. No excerpt. Just do it. Equally worthwhile is this post by John Hindraker at Power Line, "Say it Ain't So, W!" The Buckeyes crushed Northwestern today, so the game of the century is one week away. Oh, and that school up north won too. Buckeye fans can go here to get in the mood for Saturday. And also here. What a week in college football! I thought the Rutgers-Louisville game was hard to beat as an example of what a great sport this is. I think Kansas State beating Texas, which just ended, might have been even better. Rough day for the one-loss teams hoping to capitalize on Louisville's loss Thursday. Auburn and Cal joined Texas as Top Eight teams who went south today, (and Florida squeaked out a 17-16 win.) Counting Louisville, that's four this week. The winners look like USC, Notre Dame and Arkansas. I don't count Rutgers because I can't believe they'll survive the trip to West Virginia undefeated. Speaker-to-be Nancy Pelosi is poised to make one of the first key decisions that will demonstrate her level of seriousness and responsibility on matters of national security, and it appears that she will allow political considerations to trump security concerns right out of the gate. It has been learned that Pelosi will pass over Rep.Jane Harmon (D-CA), the ranking Democrat on the House Permanent Select Committee on Intelligence for the chairmanship, in favor of Rep. Alcee Hastings (D-FL). The move would be a payback to the Congressional Black Caucus, to whose support Pelosi owes her election as Minority Leader and whose members she angered by picking Ms. Harman to be ranking member over Georgia Rep. Sanford Bishop in 2003. The incoming Speaker must also mollify the Black Caucus for having pushed Louisiana Rep. William Jefferson (he of the frozen cash) off the Ways and Means Committee. A little political horse-trading in Washington is just par for the course, right? It's to be expected no less than popcorn at the movies. Whatever your thoughts about the identity politics epitomized by the Congressional Black Caucus, it is still understandable that they might be thrown a bone by the incoming Speaker as payback for whatever past slights she may be guilty of. But it shouldn't be this rotten bone. ...Since shamelessly taking his seat in the very House that overwhelmingly impeached him, Congressman Hastings has not appeared chastened by his scandal-plagued past. Reports circulate that the "Judge" is the subject of speculation about a conflict of interest. At issue this time is the fact that Hastings added to his Congressional payroll one Patricia Williams, described as a "close personal friend" and former attorney. Williams represented the then-judge at his bribery trial and impeachment hearings, but was herself disbarred in June 1992 for misuse of clients' funds. Mr. Hastings is said to owe Mr. Williams substantial lawyer's fees for her services in the eightiesâ€”over $500,000 according to some estimatesâ€”and some see his decision to make her a staff assistant as a form of debt-settling at the public's expense. Ms. Williams' annual salary as "staff assistant" is reported to be an impressive $129,000. Here are two other publicly reported annual salaries from Mr. Hastings' office which are quite telling: Vanessa Griddine, staff assistant (scheduler), $71,000; Fred Turner, chief of staff: $67,200. Ms. Griddine must be one heck of a scheduler, as she earns nearly four thousand dollars a year more than Mr. Turner, the Congressman's chief of staff. The Organization for Security and Cooperation in Europe (OSCE) reports that Ms. Griddine, not Mr. Turner, recently accompanied Hastings on a trip to Portugal and Spainâ€”earlier she had traveled with him to Brussels, at a cost to taxpayers of over $14,000. Doubtless her presence is constantly required to help arrange last-minute scheduling. Rep. Hastings record on matters of national security and intelligence is not encouraging either. There's much more in the TCS piece and a good deal of additional detail in this recent article from FPM. This job is too important, as the FPM article puts it, "to hand leadership and even more dangerous--access to Americaâ€™s most sensitive secrets--to a man who has shown that he is a criminal who can be bought" , no matter how many favors Nancy Pelosi owes to the Congressional Black Caucus. UPDATE 11/11: Hastings isn't the only Democrat in line for a key committee post who has a checkered ethical past. The most brutal tyrants in the Middle East, the regimes in Iran and Syria, are celebrating the victory of America's Democrats. And why not? They have every reason right now to believe that a Democratic Congress will do everything they can to abandon Iraq to the enemies of self-government. It's important for responsible Democratic leaders to speak out to demonstrate our united commitment to a free and democratic Iraq. Soon. Gateway Pundit has it covered. Claudia Rosett is hoping that our focus on the election won't prevent the proper attention being paid to Sen. Tom Coburn's letter to U.N. Secretary General Designate Ban Ki-Moon. Coburn recommends a set of specific reform proposals, including increased financial transparency and disclosure, and a release of documents from the archives of the Oil-For-Food investigation. In total, the proposals probably make way too much sense to have a prayer of being implemented. But you should read them anyway. The Indians started filling the holes in their lineup today, trading with the San Diego Padres for second baseman Josh Barfield. Here's the story from the club's home page. At first glance, I like what I see with this deal. We gave up Kevin Kouzmanoff, a promising young hitter who, no matter what he does in his career, will at least always be the answer to a trivia question. But Kouzmanoff is a corner infielder who is already 25, and has yet to play a full big league season. The Indians are set (we hope) at third with Andy Marte, and crowded at first with Martinez, Hafner, Garko, and Blake all being able to play the position at one level or another. Andrew Brown showed promise since coming over in the Milton Bradley trade, but is out of options, so he was expendable too. Barfield had an outstanding rookie season playing in 150 games for the Padres, and is said to have excellent defensive skills (3rd in NL in fielding pct.) and range. His offensive numbers (.280, 13 HR, 58 RBI, 151 hits) are not a dropoff from Ronnie Belliard's and his 21 steals would have put him second on the team last year. And he was a 23 year old rookie. Incidentally, the Indians were one of the better hitting teams in baseball last season, but only Sizemore (190) and Martinez (181) had more hits than Barfield's 151. Bob Godwin at One Cosmos described a phenomenon today in discussing the election, that has frustrated me to no end in dialogue I have had with people of the left over the last couple of years. That is, their refusal to accept the notion that we are at war at all. This mindset is evident in the leftist mantra that we have made terrorism worse by going into Iraq, (this despite no attacks in the U.S. in five years.) Well, we certainly have brought it out into the light where we can see it, but Iraq remains Exhibit A in their bizarre insistence that terrorism is caused by our resistance to it. Yesterday I did a little googling of the film "Obsession", a documentary on radical Islamism which was aired by Fox this past weekend, and is now available for viewing on the web. And let's just say the mindset Bob described is on display in the lefty blogosphere. Big time. I watched the 12 minute abridged version of the film, and believe that I was able to get a feel for the overall content from that preview. The film uses the words of the Islamists themselves, including footage of mass rallies of Iranians and of Lebanese Hezbollah devotees doing their orchestrated "Death to America" chants, as well as quotations from people like Nasrallah and various Palestinian and Saudi clerics from the Islamist leadership vowing to destroy America and the rest of the infidel West. The whole point of the film -- the only point -- is to show menacing footage of Muslims, accompanied by very scary music, and then assert, over and over, that they are devoted to killing all of us and that the threat they pose is exactly the same as the threat of Nazi Germany, except it's much, much worse. Except they don't say that, and of course it's not "the only point", but Greenwald exaggerates in order to make the point that you shouldn't exaggerate, and that the threat of Islamism is grossly exaggerated by (pick one) the filmmakers, Fox Network, the Bush administration....(hint...they're all the same fear-mongering, power-hungry, evil entity.) See, the Islamists don't have a great big army like Hitler did. See how silly all this war talk is? That's not all. This film is "extreme propaganda", according to Greenwald, of a piece with "the poison that the Bush movement has been feeding to this country for five years now". Why, Bush and Cheney rarely make a speech "without warning of the grave and unprecedented dangers we face from a mortal enemy that wants to destroy our society and everything we love and kill all of us?" Why do I suspect he would be equally critical of the administration if they paid only a little attention to the Islamist threat? Would that we just had more enlightened leaders, perhaps of the persuasion of Greeenwald, who would just "sit down" with the Islamists and defuse all of this talk of a new Caliphate, and "Death to America." Frankly, I always find the modern day footage of the indoctrination of the young children of Palestine, Lebanon and Iran, as shown in the film "Obsession", to be sickening, and the parallels to Naziism glaring. One would think that the fascism, and the Jew-hatred, and the genocide might also be legitimate parallels that would jump out at someone not infected with Bush Derangement Syndrome. By the way, pay no attention to the goose-stepping, the salute and the knock-offs of other Nazi imagery in today's Islamist movement. Nothing to see here. Move along. Greenwald also ignores the numbingly obvious reality that fascist terrorists no longer need large armies in order to kill hundreds of thousands of innocent people. Of course, one thing we can be thankful for is that -- unlike the violent, fear-mongering warriors they have -- our political and religious leaders (and television networks) are responsible and sober and would never use Fear of the Enemy, or religious fanaticism, as a means for justifying war. Get it? We're no better than the genocidal Jew-hating terrorists! It's all a fear-mongering plot by the neocons to retain power, you idiots! That's why George Bush has pursued this clever course all the way to a 30% approval rating and a Democratic-controlled Congress...oh, wait...never mind. Oh yeah, that just proves how stupid he is. I'm not saying, by the way, that Greenwald is himself suggesting that Bush policies are the cause of Islamist terror. He just feels that Islamist terror is a problem that has been grossly exaggerated. An important distinction of course, because his focus is on the malign intent of the neocons, as opposed to the manifestly less dangerous terrorists from the Middle East. Maybe Greenwald thinks they'll be satisfied to just incinerate Israel in a nuclear fireball, and that that's a fair tradeoff for their inability to kill "all of us", you know, literally. When pressed in the comments, Greenwald allows that "To say that a threat is being exaggerated, exploited and manipulated is not the same as saying that the threat is non-existent." How gracious of you, Glenn. Tell the thousands of family members of the 9/11 victims and other innocent victims of Islamist terror that the threat is "exaggerated." They love that. I hadn't intended to make this post be about that particular lefty. It just sort of worked out that way. ...multiculturalism devalues the concept of the individual in favor of the ethnic group, while socialism in all its forms favors the large and powerful state that unites us all (and suppresses -- for any time government does something for you, it does something to you). Deconstruction throws all objective meaning into question, so no one has to have the disappointing experience of being wrong or denied tenure, no matter how stupid one's ideas. The burden of personal responsibility is mitigated, because one's being is determined by accidental factors such as race, class and gender, not one's owns values, decisions and actions. Skillful knowledge acquired by intense effort is replaced by an obnoxious, hypertrophied adolescent skepticism that knows only how to question but not to learn. It is grounded in a sort of bovine materialism that is not the realm of answers, but the graveyard of meaningful questions. The primitive is idealized, because it is within everyone's reach; it is painful to have standards, because not everyone can attain them. LGF has the story, which seems only right. The New York Times usually favors making information public. Indeed, twice in the past two years it has published details about eavesdropping and finance-tracking efforts by the U.S. government, two of the most effective and most closely guarded programs in the war on terror. The Times stubbornly defended that reporting even after government officials said the articles had done significant damage to national security. No matter, countered the Times, the public has a right to know. But not about Saddam and the captured Iraqi records. And when the documents did begin to trickle out, the Times summoned only enough interest to dismiss the effort as a waste of time. So people who get their news from the Times may not know about the contents of documents that have already been released. One lays out plans for "Blessed July," an Iraqi regime-sponsored terrorist plot targeting Western interests in northern Iraq and Europe. Another mandates that the Iraqi regime pay foreign terrorists in the country at the same rate it paid its homegrown terrorists in the Saddam Fedayeen. Yet another details an offer from Hamas to stage suicide attacks against Americans. Still another presents a detailed plan for "utilizing" Arab suicide bombers. And on it goes. And there are other interesting documents that have not yet been released, but whose existence has been reported here and in other publications, as well as in official government reports. There's the one that confirms Saddam Hussein's Iraq trained thousands of non-Iraqi terrorists from 1998 to 2003. And the one that shows the Iraqi regime provided money and weapons to Abu Sayyaf, an al Qaeda affiliate in the Philippines. And the one that lists hundreds of jihadists imported from Gulf countries before the war. And the one demonstrating that for a decade, ending only with its overthrow, Saddam Hussein's regime harbored and financed the man who had mixed the chemicals for the 1993 attack on the World Trade Center, the native Iraqi Abdul Rahman Yasin. It's a document that might be relevant to the national debate--now in its fifth year--about whether Iraq is part of the war on terror or a distraction from it. And yet the Times has not once mentioned it in its pages. Belmont Club links to the video of Fox News reporter Steve Harrigan undergoing the waterboarding interrogation technique, and then opens up a discussion of the efficacy, ethics and morality of the practice. Over at Viking Spirit Blog is a post linking to the GOP telephone Get Out The Vote campaign. If you have an hour or two to spare between now and Monday night, and can make a few calls, check it out. They'll supply you with 30 names and numbers of people to call in key states where our help is most needed. Do what you can. Every sports cliché ever spoken or written. Really. With some luck I managed to land in a side-street in front of a synagogue â€“ Europeâ€™s biggest I heard. While trying to save myself I had to think of a young woman with a baby hung in her front and one in a cart who was near me when all this started. As I tried to escape by moving away from the direction of the attack I ran into people trying to flee to where I ran from. It soon became clear that at least several of the four streets leading to the crossing where we had been addressed were blocked by riot(ing) police. Therefore it is surprising that the confusion and the panic did not escalate into a blood-bath. UPDATE 11/8: More on the Budapest riots (including photos) from EU Referendum. We floated the idea a month ago that the No. 1 Buckeyes had a chance to possibly face three different No. 2 ranked teams this season, and wondered if anything close to that scenario had ever happened before. That prospect seems ever more likely now, and Ivan Maisel has done the legwork on the subject. I figured somebody would eventually save me the trouble of researching it. Not only would the Buckeyes be the first No. 1 to win three games against No. 2s, there have never been three 1 vs. 2 games in one season in the 70 years of the Associated Press poll. In fact, Ohio State's 24-7 defeat of Texas on Sept. 9 was the first regular-season game between the two highest ranked teams in 10 years. Only twice before, in 1943 and 1945, has a regular-season No. 1 played two No. 2 teams. In 1943, Notre Dame beat Michigan 35-12 and Iowa Pre-Flight 14-13. In 1945, Army beat Notre Dame 48-0 and three weeks later beat Navy 32-13. Regular-season 1 vs. 2 games rarely took place before the late 1980s. After Army and Notre Dame played their famous 0-0 tie in 1946, No. 1 didn't play No. 2 again until 1963, when Texas beat Oklahoma 28-7. In 1985, however, college football fans began to get lucky. In seven of the next nine seasons, No. 1 played No. 2. After second-ranked Notre Dame upset top-ranked Florida State 31-24 in 1993, there would be only one such game in the next 12 years, the Seminoles' 24-21 upset of Florida in 1996. What happened to 1s vs. 2s? Simple: In 1992, the limit on I-A scholarships dropped to 85. The talent spread among more teams. That's why eight Big Ten teams have won at least a share of the conference championship in the last seven seasons, why in the last 10 years no SEC team has won more than two league championships. All of which is to say that college football fans are lucky this season. Enjoy the regular-season games between No. 1 and No. 2. You never know when they'll come around again. ...those of us who take a skeptical approach to these doomsday climate scenarios aren't trying to end the discussion. The Earth is warmer now than it was in the recent past, and this may be partly attributable to human behavior. But everything else--from how much warmer, to the extent of mankind's contribution, to the cost of doing something about it--remains very much in dispute. Some of the Stern review's recommendations, such as carbon trading rights, are also worth debating. But most of its proposals are merely openings for government to expand its role in allocating investment, raising taxes and otherwise controlling economic decisions. Socialism was supposed to have died with the Soviet Union, but it is making a comeback under the guise of coping with global warming. Meanwhile, there are far more urgent, and far less speculative, problems that we know how to solve with the right policies. That message may not get scary headlines, but it would improve the lives of more human beings around the world. Last weekend in New York, I asked 24 U.N. ambassadors--from nations including China, India and the U.S.--to prioritize the best solutions for the world's greatest challenges, in a project known as Copenhagen Consensus. They looked at what spending money to combat climate change and other major problems could achieve. They found that the world should prioritize the need for better health, nutrition, water, sanitation and education, long before we turn our attention to the costly mitigation of global warming. We all want a better world. But we must not let ourselves be swept up in making a bad investment, simply because we have been scared by sensationalist headlines. The Sports Guy has his NBA Preview out, and he picks the Cavs to make it to the Finals, where fittingly, he has them losing to the Spurs. I'd be happy with that. They say you have to make it to the Finals and lose before you can make it there and win, although the Miami Heat weren't buying it last year. Simmons thinks Cleveland's point guards aren't good enough to win it. But you don't have to be nicknamed "The Sports Guy" to see that. UPDATE 11/3: I guess that would make the game tonight Simmons' early finals preview. The best player on the planet had 35, and the Cavs won in San Antonio for the first time since 1988-89. Lots more good stuff, so read it all. I don't think this flap will hurt Democrats' electoral prospects significantly, (though it is my fervent hope that it will.) But it really should put an end to John Kerry's national political ambitions. He has already proven that it is not enough to get him to simply shut up, even for a minute. UPDATE 11/1: An older Boston Globe article, for anyone who hadn't been aware of this, points out that John Kerry's grades at Yale were "lackluster"...lower even than those of the object of his botched joke. Yeah, but he sure cut a dashing figure in his college photo. I knew I had seen that photo before. It was in the dictionary under "tool". What was especially moving was this emotional note in your statement: "I'm not going to be lectured by a stuffed suit White House mouthpiece standing behind a podium, or doughy Rush Limbaugh, who no doubt today will take a break from belittling Michael J. Fox's Parkinson's disease to start lying about me just as they have lied about Iraq." How right you are to realize that attacking a disabled person or one who has suffered a serious illness is the worst thing that can be done by a civilized person, so dire that, of course, you feel free to insult Rush Limbaugh, a radio performer who has carried on uncomplainingly in spite of his deafness, and Tony Snow, who has recently suffered a bout with serious cancer. Yeah, I know. Shooting fish in a barrel. UPDATE 11/3: The Hatemongers Quarterly on Kerry. Good stuff.